This entry was posted in Garden Design, Landscape Architecture, Sustainable design on 28th August 2012 by Tom Turner. 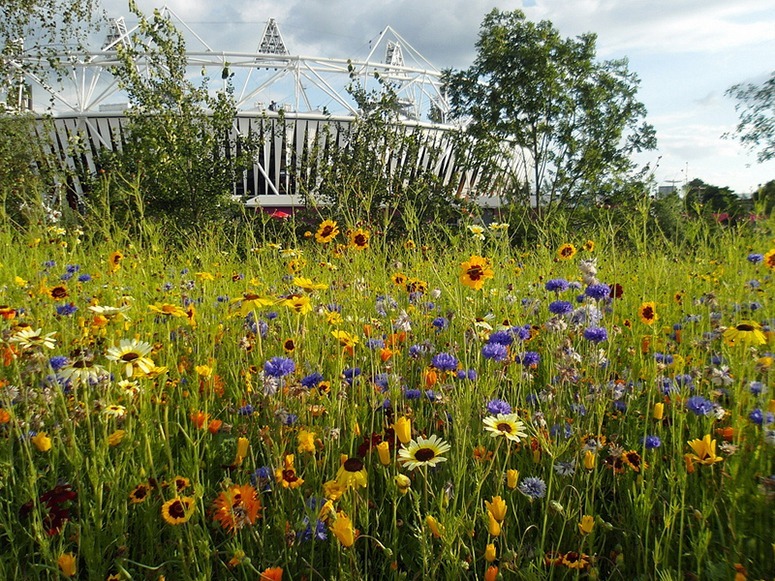 Is this a wildflower meadow in London's 2012 Olympic Park? EDAW (now AECOM) produced the master plan for what was the Olympic Park during the games and will re-open as the Queen Elizabeth Park in 2013. The idea for the planting design may have been theirs. LDA with George Hargreaves produced the design plans – and probably commissioned Dunnett and Hitchmough. Christopher Lloyd was inspired by his mother, the beautifully named Daisy Lloyd, who made a flowery meadow at Dixter which she connected with the meadows in renaissance painting (eg Botticelli’s Primavera) and Pre-Raphaelite painting. Daisy also introduced Christopher to Gertrude Jekyll – and both were surely influenced by William Robinson. William Robinson shared John Ruskin’s love of the middle ages. He wrote a famous book on The Wild Garden and advocated ‘wild flower meadows’ instead of mown grass. A medieval ‘meadow’ was ‘a piece of land permanently covered with grass to be mown for use as hay’ OED (mædewan, mædua, mæduen, etc in Old English). Meadows contained wild flowers and meadow turf was cut from pastures and laid in gardens, probably as ground cover in small herbers for the delight of ladies and minstrels. ‘Mead’ is cognate with meadow. Deriving from Old Dutch and Old German, it was used rarely in Old English but later became popular with poets etc in the combination ‘flowery mead’. The flowers in old English meadows were, of course ‘wild’ flowers. Those used in the Olympic 2012 Queen Elizabeth Park were wild somewhere at some time. But many are cultivars from outside the UK. If my plant identification is satisfactory, the above photograph has: Coreopsis (Tickseed, native to North America), Centaurea cyanus (Cornflower, native in the UK), Chrysanthemum carinatum ‘Polar Star’ (a cultivar of the annual chrysanthemum, native to North America), Calendula spp (pot marigold, native to the Middle East). The drifts of annual and perennial plants in the Lea Valley have visual connections with meadows and the flowers are, or were, wild in some place at some time. But they will not be used as pastures and one could make a good case for NOT calling them ‘wildflower meadows’. As Immanual Kant observed, paradox is an inescapable aspect of how we understand the world. This entry was posted in Garden Design, garden history, Public parks on 23rd August 2012 by Tom Turner. We tend to think of a mandala (मण्डल) as a graphic pattern, though the Sanskrit derivation of the word is from the ‘cycles’ or ‘circles’ (ie ‘sections’ or ‘books’) of the Rig Veda. The Vedas were hymns recited on ritual occasions. Mandala patterns were developed to symbolise the rituals and the ideas underying the rituals. Buddhists took on the idea from Hindus and used mandala patterns in the design of stupas (chortens), tankas and many other things. Used in this way, a mandala symbolises the geography of the cosmos. Early mandala patterns had a lotus flower with open petals and the Buddha at its centre. Circles and squares were added and a mandala came to represent the four material elements of the universe (earth, water, fire, wind) with Mount sumeru as the world axis. Energy moves in a cosmic dance from the centre to the periphery, and then back to the centre, encompassing inanimate and living things. Buddhist Chinese and Japanese gardens are also mandalas. The word ‘Pagoda’ derives from ‘stupa’ and these gardens symbolise the cosmos, with the temple as a house for a Buddha. In later Chinese gardens temples evolved into garden pavilions for the delight of their owners. A real landscape can also be a mandala, with the Lapchi region on the Nepal-Tibet border a famous example, which includes Milarepa’s Cave. Lapchi’s mandala landscape is conceived to have three sacred triangles formed by the sky, the earth and the three rivers. The central mountain is seen as the Palace of Chakrasamvara. The landscape around the Druk White Lotus School in Ladakh can be thought of as an emerging mandala landscape. It has a modern mandala plan, by Arup and Arup Associates. It is in view of three famous Buddhist gompas: Shey, Thikse and Matho. Tibetan Sand Mandala – Timelapse – 30 fps a video by camera_obscura [busy] on Flickr. This entry was posted in Asian gardens and landscapes, Buddhist gardens and environmental ethics, DWLS Dragon Garden at Druk White Lotus School, Garden Design, garden history on 19th August 2012 by Tom Turner. The principle of involving school children in the landscape and garden design for the space outside their classrooms applies in every land. This video illustrates the involvement of children from the Druk White Lotus School in Ladakh India. There are many reasons for involving school children in the design of school grounds: (1) the children are creative – they know what they like to look at and what facilities they like to have (2) the children learn to take responsibility for their environment (3) the children have an involvment with the natural world (4) the children learn technical skills (5) with luck, some of the children will go on to become landscape architects, taking responsibility for the conservation and improvement of Planet Earth. This entry was posted in Asian gardens and landscapes, Buddhist gardens and environmental ethics, DWLS Dragon Garden at Druk White Lotus School, Garden Design on 17th August 2012 by Tom Turner. Should Ladakh be modernised? Can it be avoided? Anyone travelling to Kargil or Leh via the Zoji La must think ‘This CANNOT be the main road to Ladakh’, ‘It is inconceivable that most of the country’s fuel and construction materials are carried in on this road?’ ‘Surely it can’t be closed for six months/year?’ ‘Why in heaven’s name haven’t they built a tunnel’, ‘Is this country run by 3 idiots?’. But anyone who reads Helena Norberg-Hodge’s Ancient Futures: Learning from Ladakh may conclude ‘Please God, don’t let them build a new road over the Zoji-La’. She argues that ‘development’ is spoiling Ladakh. The men are giving up farming to become taxi drivers. The women, who lived in rural bliss in wonderful communities, are now finding themselves isolated in ugly modern flats with their husbands doing urban jobs, their young children in schools and their older children hanging about on street corners, taking drugs and thinking about motorbikes and larceny. Though my sympathies lie with Helena Norberg-Hodge, I don’t know who is right. But I do know that work on an all-weather Zoji La Tunnel is scheduled to begin in 2012. Should it happen, the above video will be a visual record of the pass in July 2012. The longest delay was on a good section of road, just below the pass, near the turn-off to Amarnath (see photos), a stalagmite worshipped by Hindus as the phallus of Lord Shiva – which has melted because growing numbers of devotees are generating too much body heat. The number of pilgrims on the Amarnath Yatra has risen exponentially over the last decade. Almost 100 of them died this year and over 40,000 received medical treatment. They sleep in the largest camp site I have ever seen (which can be glimpsed on the video). I was travelling to the Druk White Lotus School and thinking about how it could have a Dragon Garden to go with its mandala plan. A landslide closed the road for a while, as though a local dragon had stirred. This entry was posted in Asian gardens and landscapes on 9th August 2012 by Tom Turner. The architectural layout of the Druk White Lotus School, designed by Arup Associates, is based on a mandala. In the Sanskrit of the Rig Veda, the sections were called mandalas, meaning ‘cycles’ or ‘chapters’, rather as TS Eliot divided his Four Quartets into sections. The Rig Veda poems are often described as hymns and were receited by nomads on ritual occasions. When the nomads became settlers special places, including temples, were designed for rituals and they too became known as mandalas. Hindu and Buddhist sacred places, including stupas, are therefore said to have a mandala plan. In Tibetan and Ladakhi culture, which are Vajrayana Buddhist, a mandala is interpreted as a diagram which represents the geography of the cosmos. The Druk White Lotus School (DWLS) was built in the desert outside Shey, the former capital of Ladakh. The buildings are nearing completion in 2012 and the next stage is to convert the school surroundings from desert to garden and landscape. Since the school was made under the auspices of the Drukpa Lineage, making a ‘Dragon Garden’ is appropriate. ‘Druk’ means ‘Dragon’ and ‘Druk-pa’ means ‘Dragon-person’, with the Lineage led by the Gyalwang Drukpa. What form a ‘Dragon Garden’ might have is yet to be determined. The above video shows a school ritual (a morning assembly) taking place in a Dharma Wheel at the centre of the DWLS Mandala. Note that the children sitting beside the monk are using their hands to form the mudras. My impression is of kindly, enthusiastic and warm-hearted children – and I wish I had a similar impression when looking at school children in london. Mandalas can take many forms and can be made in many ways. 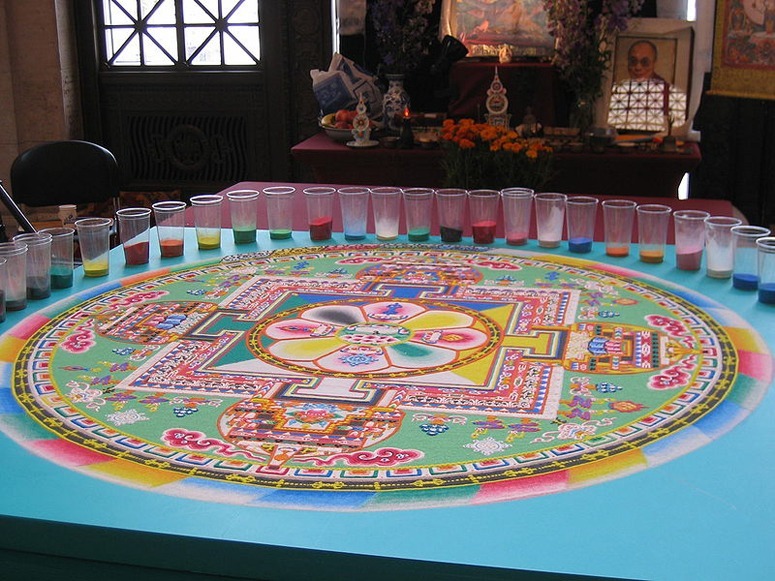 The below image shows coloured sands used to make a sand mandala. 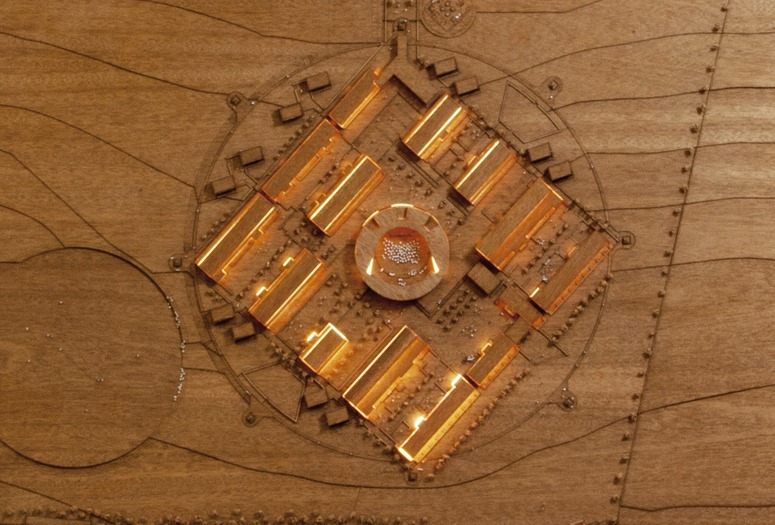 A model of the mandala section of the plan for the Druk White Lotus School, by Arup Associates. This entry was posted in Asian gardens and landscapes, Buddhist gardens and environmental ethics, DWLS Dragon Garden at Druk White Lotus School, Garden Design on 6th August 2012 by Tom Turner. OK, I am a grunge re the 2012 London Olympics. For example, I drove past the Olympic Park last night at a peak period when the official websites were predicting fortissimo traffic chaos. The A12 was almost deserted and the Olympic Lane had nothing but empty buses. London is being described as a Ghost City, because so many sensible Londoners have fled to the shires. So what of Greenwich Park? Unable to get a ticket, I looked first to the BBC, whose website had crashed. So I turned to Youtube and thank keirshepherd for the above video. It is nice to see folk having a great day out in the Park but (1) it looks as though I could have had a ticket without the Park becoming over-crowded (2) the competitors look amazingly relaxed – are they judged on the jumps and not on their speed? 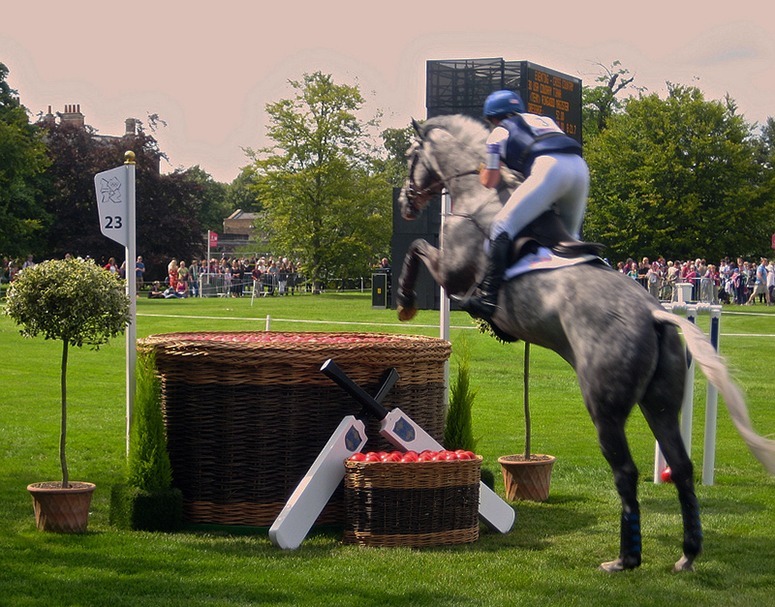 (3) where on earth did the kitchy ideas for the jumps come from? They make the aesthetics of Disneyland in the 1960s look restrained and tasteful. To find anything as bad in everyday London, the only place I can suggest is a pet superstore. Do we conceive the animal world as inferior to the youngest kids? Are horses imagined to enjoy trashy sentiment and sickly colours? Greenwich Park was designed as a place to keep deer and for the young royals to learn horsemanship. One can imagine the Queen Elizabeth I taking the park at full pelt. The spirit of the Tudors could have been caught with a wild racing gallop – more Cecil B DeMille than Micky Mouse. This entry was posted in Garden Design, garden history on 6th August 2012 by Tom Turner.